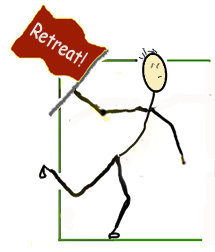 Retreating doesn’t mean surrender, submission, giving up or wallowing in a pool of self-pity. Smart CEO’s retreat all the time. It’s the intelligent thing to do when the direction you’re headed is no longer producing the results you want—doesn’t matter if it’s personal or financial. If your best work just isn’t cutting it, and you’ve exhausted all options and possibilities, then by all means pull back, retreat, and reinvent your game plan—which for some may include getting a “real job” for awhile. There’s no shame in that by the way, and it doesn’t mean you’ve quit or failed. It just means you’re making an intelligent decision regarding your wellbeing and the preservation of your personal goals. To step away for a time, provides you the opportunity for a fresh POV, (along with the possibility of generating a more reliable income). Don’t forget that you’re different. You have an “edge up” on most others. You’re a creative artist/trep, and unlike others, you have the ability to create ways of reworking your art and reinventing your business. You also possess the rare gift of devising innovative ways of manifesting more money. Truth is, what I have noticed, is that some folks quit in quiet despair. However, others retreat, to adjust their course, until they find an alternate path to continue the pursuit of their goals, dreams and desires.